With Marcos to help, I figured I could have the projects done in half the time. My new crew – Kemi Vernon and Mckenzie Clark – had already arrived, but I’d sent them off to surf Panama by land while I worked on Swell. Marcos was busy for a few days, so in the meantime I dove into the daunting task of taking inventory and reorganizing canned food and boat supplies. This way I would know exactly what I needed to buy to stock the boat for the South Pacific. In the meantime, the first south swell of the season had arrived and I pictured the girls paddling down the face of a Santa Catalina nugget while I made tally marks for cans of corn and tuna on my master inventory list. I tried desperately not to think about it, but more than a few times a day, my eye would twitch and my skin would leap at the vision of that wave. I stayed mentally afloat by stand-up paddling on the longboard and hurling myself into a one-foot rock-cluttered spit of whitewash on the south side of the bay. I also treated myself to fresh juice from my newly-purchased juicer and indulged in assorted goodies, like blueberry jam and cheesecake from the amazingly Americanized markets. The first day Marcos came over to help I was curled in a pathetic heap on the cabin floor, battling exhaustion and a nasty cold. With the explosion of projects, there was nowhere else to sleep. He quickly returned with chicken noodle soup and ideas about our impending venture. By the next morning I felt better and we dove head first into the list. As we changed the oil in my main engine after conducting a basic overhaul, Marcos suddenly looked up at me like he’d seen a ghost. “No.” I shook my head stubbornly. “It can’t be.” But I shoved my hand into the darkness and felt the jagged sharp edges of the severed mount. The one on the other side was the same. I couldn’t believe it. Thankfully, due to the configuration of my motor, the universal joint of the v-drive had absorbed the motor’s 2-inch drop when the mounts had broken, so there was no damage to the drive shaft. It did slightly damage my morale, though. I knew that this meant a whole new project – a major one – and I fretted about my schedule and the girls who were waiting. This would tack on an extra week, maybe two, to our already delayed departure. Surfing floated even farther from my grasp. Over the next two weeks, Marcos helped me aboard Swell when his other jobs allowed. We worked together well – both full of energy, but always taking care to do things correctly. He was patient, intelligent, and resourceful. When we’d hit a project roadblock I’d often dramatically lose hope, while he’d offer up a flurry of solutions. Like when the man at the Yanmar store quoted me $350 dollars and a 15-20 day wait for new motor mounts, Marcos introduced me to Olly, the eccentric German welder who’d been on his sailboat in Panama for eight years. Olly reinforced and re-welded my broken motor mounts for $80 and had them done in four days. Marcos knew the city inside and out too, which removed the element of challenge to finding parts and supplies. 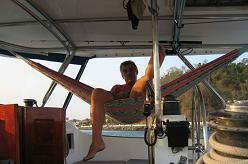 His mom fortified us with marvelous Colombian cuisine in the evenings, while Gary spouted tales and complimented his beloved wife from his prone position in the hammock aboard Plan B. By the time we finished, two weeks later, Marcos had helped me far more than the worth of the outboard. One night aboard Plan B I was talking to Mabis while she prepared dinner in the galley. “I would probably still be on the first project if it wasn’t for him,” I told her. She couldn’t have been more right. Marcos was my Panama City angel. And not once did he ever expect anything in return for his kindness. As we neared the completion of the projects, I asked him why he’d done all of this for me. He replied casually, “I want to help you towards your dream. 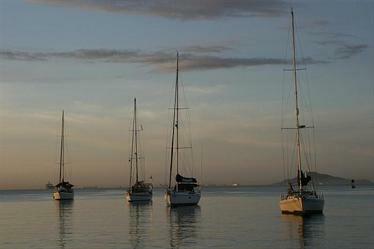 I dream of sailing to the South Pacific too one day, but now is not my time. It’s yours.” Unlike many other men I’d encountered in the city, he wasn’t begging to crew or get married. He was just a good person. We enjoyed working together, too. We exchanged repair tips and tool techniques, and generally came up with more evolved solutions than either of us had originally thought up. His polite and patient manner and wicked integrity dispelled any stereotypes of Latin machismo. I can’t say enough about Marcos’s good nature – his generosity and support were more than I could have asked for from a family member, let alone a perfect stranger. I know that what he did for me will come back to him in some other beneficial form. On the days in between Marcos’s help, I caught up on emails, writing obligations, and other internet necessities at the T.G.I. Friday’s on the opposite end of the Causeway. They offered free wireless internet and an unbeatable three-course lunch special for $14.95. When I’d accumulated enough hours there to start getting paid overtime, the servers and I began to share equal amounts of pity for one other. While they whispered about the disheveled and lonely gringa on the computer, I withheld how ridiculous they looked in those dignity-robbing outfits. When I couldn’t take another B-52’s song, I’d kick my way towards Playita on my skateboard under the orange streetlights of the causeway, finding stairs to bump down or anything my mind could mold into part of a wave. These rides are some of my favorite memories of the city – rolling along with the cool north wind in my face. The lights of the city skyline winked at me on one side while the arches of the Bridge of the Americas glowed on the other. Panamanians jogged or bicycled by in both directions. I imagined myself flying along the division between North and South America; free as a fallen leaf tumbling on the wind.